George Fox University announces a tenure-track faculty position in Spanish at the rank of Assistant or Associate Professor, to begin in August 2017. The successful candidate will teach a range of Spanish acquisition and Latin American or Iberian culture and literature classes for majors, non-majors, and Spanish heritage speakers. Service as department chair for the Department of World Languages is desired, though not required. For more details, please consult the George Fox University website. Come for a one week Spanish immersion experience this summer! Beginning through Superior level classes. Due to the increased demand we’ve seen this year for ORVED’s online courses, and especially Spanish and French, ORVED is looking for more Foreign Language teachers! ORVED teachers work online, set their own hours, and determine how many students they want to teach (max of 59 students per teacher), to make online learning rigorous and authentic for students throughout Oregon. ORVED works in partnership with schools to provide blended and online learning options for students within their local school and community. This is part time work, so if you know an Oregon licensed teacher of Spanish or French (grades 6-12) who might want to work some on the side to supplement their income, or even a retired teacher who might want to work a little doing what they love, please let them know we have students on waiting lists right now, and Principal Kerri Smith would love to hear from them. She can be reached at (503) 614-1300 or kmsmith@nwresd.k12.or.us. The 2016 COFLT-WAFLT Joint Conference will take place at Sheraton Portland Airport on October 13-15, 2016. The conference is hosted jointly by COFLT and WAFLT. The theme is "Impact COFLT-WAFLT." National keynote speakers and workshop presenters include Martina Bex, Stephen Krashen, Carol Gaab, and Karen Rowan. We must give the hotel final meal counts on October 1. Any conference registrations received after October 1 will not include meals. Registration for Stephen Krashen and Karen Rowan's pre-conference workshop is limited to 100 participants. Register soon to reserve your spot. Krashen Pre-Conference Workshop fee: $100. Post-conference workshops with Carol Gaab and Martina Bex are also limited to 50 participants each. Gaab or Bex Post-Conference Workshop fee: $25. 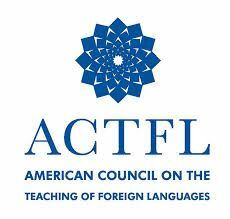 At its meeting in San Diego, CA in November 2015, the American Council on the Teaching of Foreign Languages (ACTFL) Board of Directors approved a proposal to make changes to the way the organization delivers benefits to its members. As a result of this action, on July 1, ACTFL will unveil a new tiered membership structure. Since its founding in 1967, ACTFL has offered membership based on the career stage of the individual—Regular, New Teacher, Student, Retired. Moving forward, membership categories will be benefit-driven, giving members more control over the benefits they receive and in what format. ACTFL has created some unique membership packages that will allow language educators to choose the benefits that best help them achieve their professional goals, including a BASIC online-only level, a PLUS level that closely mirrors the existing package of benefits, and PREFERRED levels that bundle professional development like ACTFL virtual learning modules, as well as some of ACTFL’s acclaimed publications. For existing members, nothing will change until the next renewal period. At that time, members will have the ability to choose which new membership level works best for them. As an added convenience, they’ll also be able to pay for their membership in installments and/or set up auto-renewal. Questions about ACTFL membership? Contact ACTFL at (703) 894-2900 or membership@actfl.org. The Center for Global Studies at the University of Illinois, Urbana-Champaign, is pleased to announce fellowships and development grants to support the internationalization of community colleges nationwide. We invite applications from faculty, librarians, and administrators interested in expanding global studies curricula, instruction in less commonly taught languages, library collections or international education programs at their home institutions. Fellows will have the opportunity to work one-on-one with international and area studies reference librarians and explore the unlimited print and online resources of the University of Illinois Library. Now that this opportunity is available for community college faculty, librarians, and administrators, the Center for Global Studies would like to ask for your assistance in publicizing this call for applications. Our center would greatly appreciate if you could forward this announcement to interested parties through your institution's resource pages, newsletters, social media outlets and listservs. The 2016 Global and Area Studies Summer Lab is open from July 18 until July 29. Fellowships will cover travel, housing, and parking costs and a research honorarium for select participants. Participants will be eligible to receive subsequent development grants. For more information on awards, eligibility, and instructions to apply, visit our website. The Center for Global Studies partners with the Russian, East European, and Eurasian Center (REEEC) to promote the internationalization of community college curricula. Follow this link for more information on fellowships and the Summer Research Lab at REEEC. Participants in the two programs will be invited to share their work and establish collaborations in a joint workshop on July 22. To be considered for full funding, please submit an online application by May 2, 2016. Applications will be accepted until May 17, 2016. Are you interested in exchanging ideas on international partnerships and engagements with representatives of higher education from around the world? Participate in the Conference on Global Collaboration in Higher Education at Illinois, August 1-2, 2016. Additional funding may be available for Summer Lab participants. This program is made possible by generous funds from the U.S. Department of Education Title VI Program and co-sponsorships from the Center for East Asian and Pacific Studies, the Center for Latin American and Caribbean Studies and the Center for South Asian and Middle Eastern Studies. Greetings from the University of Colorado Boulder! 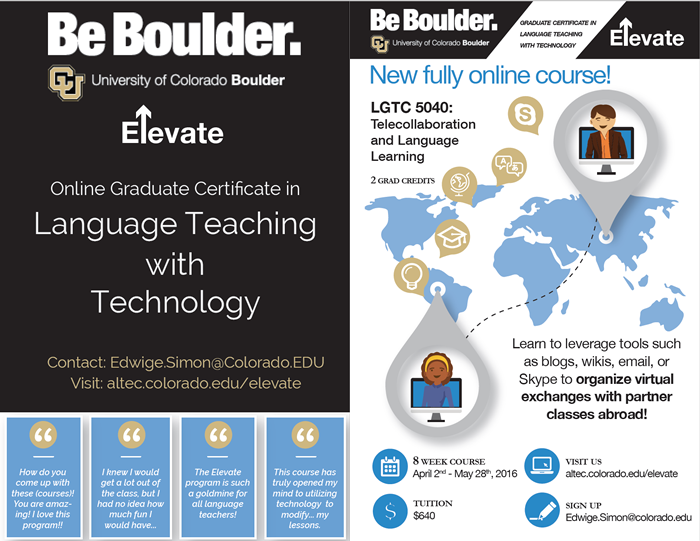 My name is Edwige Simon, I am the Director of the Elevate Certificate in Technology Integration in the World Language Curriculum offered elevate-certificate.pngby the University of Colorado Boulder (http://altec.colorado.edu/elevate). Elevate is a brand new, fully online and very affordable graduate program designed specifically for language educators. Our next course will be on Telecollaboration and Language Learning and teach how to organize linguistic and cultural exchanges with partner classes abroad using simple and free tools such as blogs, Skype, or e-mail. It is an 8 week, fully online course worth 2 graduate credits. Tuition for this course $640. Please check out the attached flier and help us spread the word about this unique program by sharing it with your fellow language teachers in Oregon. Feel free to email me or call me if you have any questions or suggestions for Elevate or if you would like to see a copy of the syllabus for the upcoming course. My cell phone is (303) 249-5970. Elevate is growing! We are adding new courses. Join the Elevate mailing list to get notified of upcoming courses, program news and scholarship information. Job Opening: 1.0 FTE Spanish Teacher. Click here to view the vacancy notice. The teacher application is below. The deadline is March 30, 2016. To download a teacher application, please click here. If you have any questions regarding the teaching application, please contact Linda Pieratt atlpieratt@jesuitportland.org. Southern Oregon University offers the Summer Language Institute, designed specifically for high school and middle school teachers. Please note that the application deadline is only two weeks away, on March 3, 2016! The Summer Language Institute is a unique and intensive program. Students can earn their MA degree in Spanish or French Language Teaching over the course of three summers, or take classes for professional development, all on site in beautiful Guanajuato, Mexico or Angers, France. Please see our web page for complete information. Saturday, March 12 at Lewis and Clark College, Portland. All workshops will run from 9 a.m. to 4 p.m with a one hour lunch break (lunch provided). Visit the Spring Conference page for more information.